Preheat oven to 180C/350F/Gas 4 and line a baking tray with baking parchment. Mix the flour, sugar and baking powder in a bowl and rub in the cubed butter until the mixture looks like breadcrumbs, then mix in the raisins. In a clean bowl, beat the egg and milk together. Add the egg mixture to the dry ingredients and stir with a spoon until the mixture just comes together as a thick, lumpy dough. Add a teaspoon more milk if the mixture is a little dry and doesn’t stick together. Bake for 15-20 minutes, until golden-brown. Remove from the oven, allow to cool for a couple of minutes then turn them out onto a wire rack to cool. 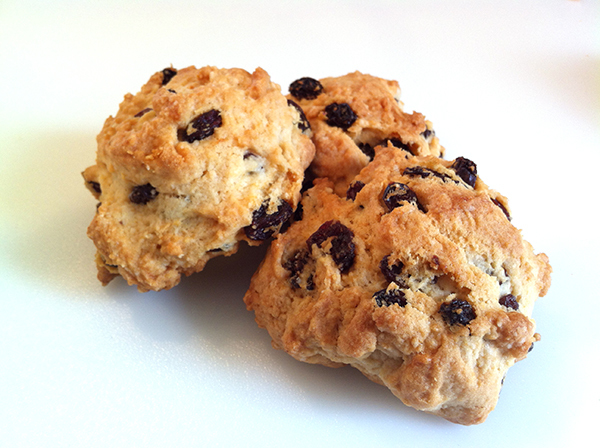 The rock cakes will keep for 2-3 days in an air tight container.